Hundreds of Midland residents paid their final respects to H. J. Thompson at funeral services held at St. Paul’s United Church. The casket is seen passing an honour guard composed of members of Caledonian Lodge A. F. and A. M. of which Mr. Thompson was a past master. Active in many phases of the town’s life during his 50 years residence here, Herman Thompson died suddenly at his Yonge Street home Monday afternoon, he was in his 66th year. 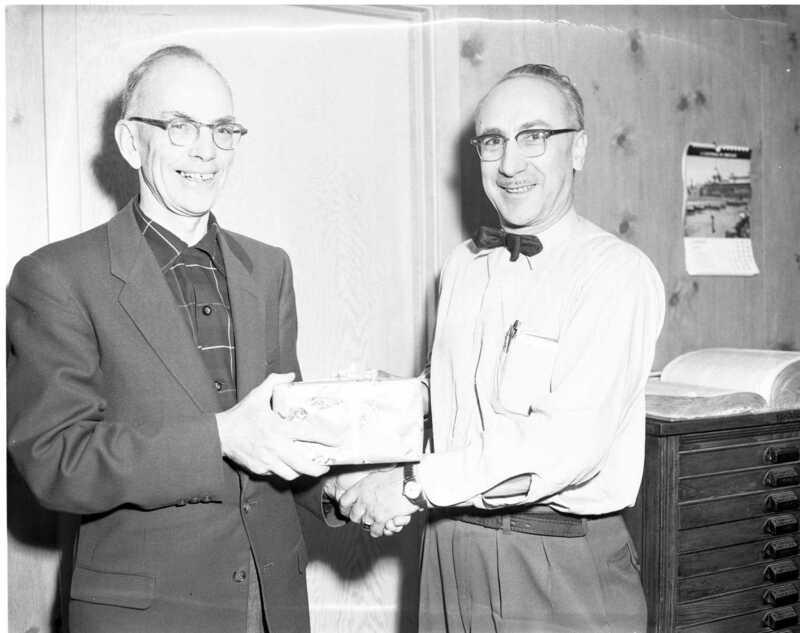 Mr. Thompson was a member of St. Paul’s United Church, where he had been a member of the Board of Stewards for many years. As co-chairman of the Building Committee, he also played a prominent part in the raising of the money for the large new addition to the church opened in late 1955. Born at Woodford, a village near Owen Sound, Herman Thompson was only in his early teens when he came to Midland in 1907. 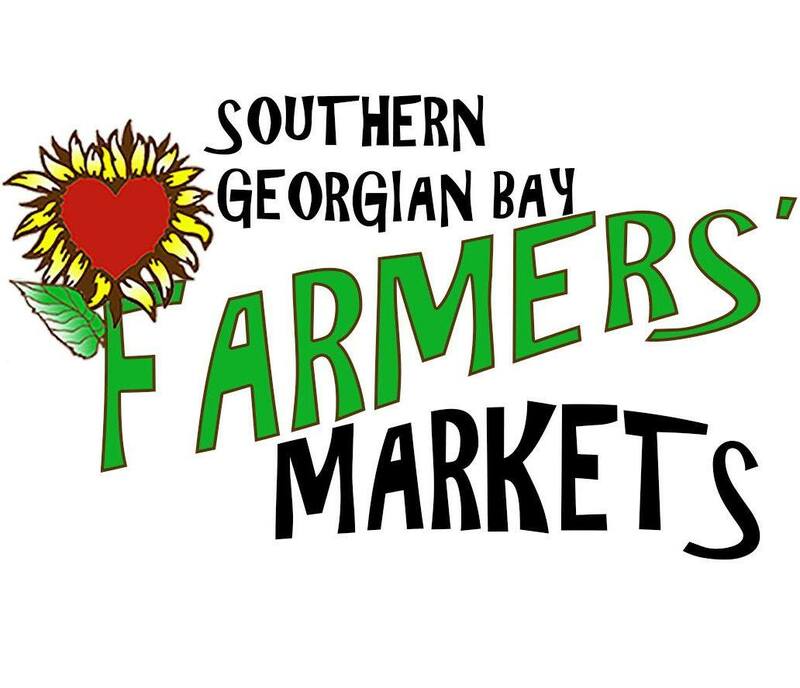 In 1914 he became associated with T. J. Campbell, who had established a plumbing and heating business on King Street at the turn of the century. In 1951 the firm of T. J. Campbell and Co. Ltd. surrendered its charter and became H. J. Thompson and Sons Ltd. Mr. Thompson became president, with Mrs. Thompson as vice president, Miss Charlotte Thompson (his sister) as secretary, and his son Jack, as treasurer. His other son, Bill, was also associated with the firm, which in later years expanded to include plumbing, heating, sheet metal and electrical contracting and appliance sales. (The Bill Thompsons were strong supporters of Huronia Museum). In addition to his many business connections, Mr. Thompson served the town in a variety of organizations. A staunch supporter of the chamber of commerce, he had served as president and was chairman of the Industrial Committee when many new industries were secured. Mr. Thompson also served the town for a quarter-century on the old Board of Education and for a like period as treasurer of St. Andrew’s Hospital. But Mr. Thompson is perhaps best known for his interest in the Midland YMCA; on whose board he served for 30 years, including four as president. He also found time to serve on municipal council for two years, one term of which was as deputy reeve. Mr. Thompson also served his country in two world wars. In the first, he attained the rank of captain in the Grey and Simcoe Foresters and served overseas. In the second, he served equally well at home as Midland chairman of eight of the nine victory loan campaigns. In ill health in recent years, Mr. Thompson had been forced to curtail most of his community activities. Surviving are his wife, the former Edith Bateman of Mount Forest; two sons, Jack and William; a sister, Miss Charlotte Thompson; and a brother, W. Ewart, all of Midland. New members of Midland Council pictured at their inaugural meeting. 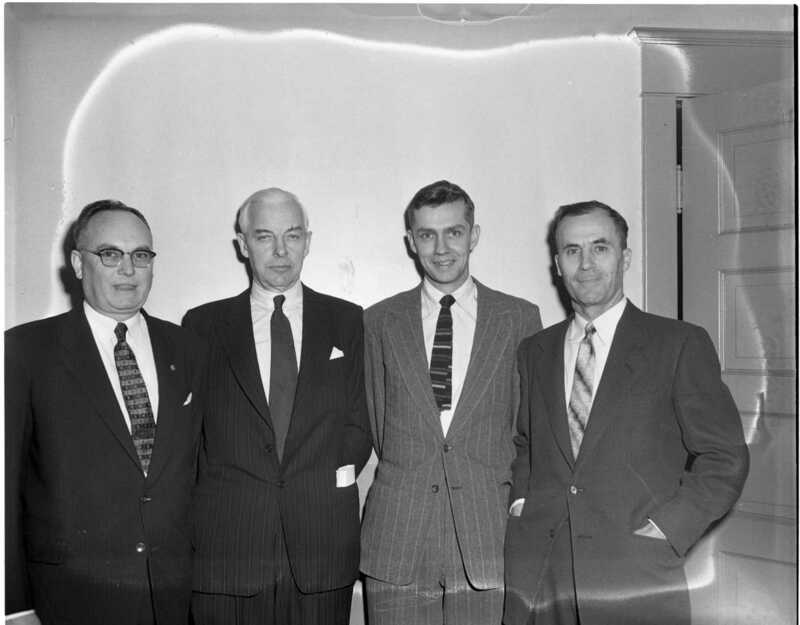 William Orr, R. J. Pinchin, Douglas Haig and Herb Beauchamp. Possibly the largest crowd to date to use the facilities of Midland Resorts Ltd. took advantage of the perfect conditions last weekend. 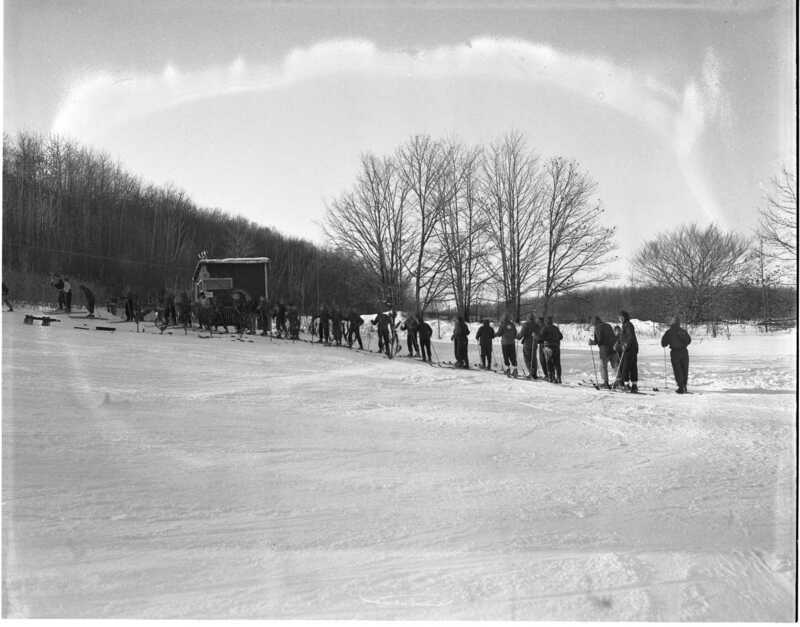 This was the long line of skiers waiting for their turn on the rope tow. Midland Ski Club. A careless driving charge has been laid against a Midland resident after he forced the driver of this southbound transport onto the shoulder of William Street between Hugel Ave. and Elizabeth Street causing the truck to tip and spill its cargo of 23 tons of coal. 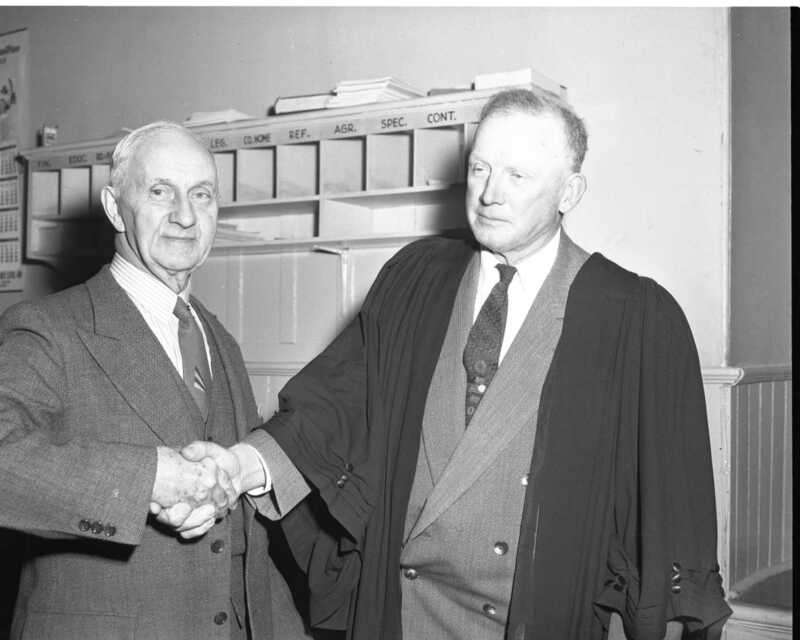 Reeve W. H. Keller of Midland, on the left, congratulates Simcoe County warden Fisher Ganton of Medonte after his election Tuesday in Barrie. Keller’s defeat downed Midland’s hopes for their first Reeve in 40 years. Chairman of South Georgian Bay District apple day for 13 years, James A. Lennox, right, was honoured this week by members of the association for his work in furthering Boy Scouts in this region. Rev. Ralph Wright, pastor of Calvary Baptist Church, Midland, and president of the SGBD Boy Scouts Association presents Mr. Lennox with a gift. 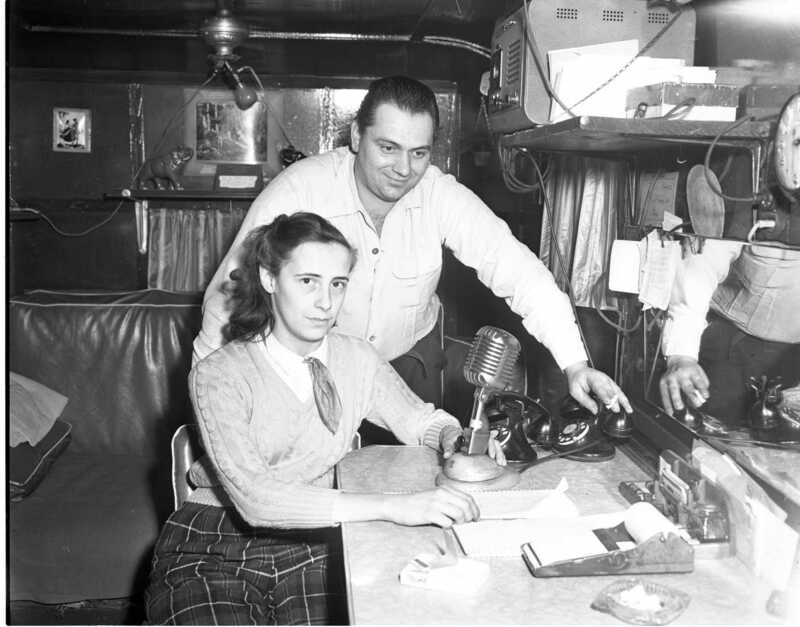 New owner of Wilson Taxi in Midland, Joe Levechia gets help from his wife Eleanor (nee Reynolds of Midland), seen speaking to one of the radio directed cabs from their trailer office on Dominion Ave. Mr. Levechia who comes from Port Colborne was a sailor for eleven years before buying the taxi business from Meredith Wilson. School board chairman Tom McCullough tries to cut the ribbon to officially open the new gymnasium at MPDHS to inter-collegiate sports. Someone intentionally or otherwise handed him a pair of scissors that wouldn’t cut paper, a problem he quickly resolved by breaking the ribbon with his hands. 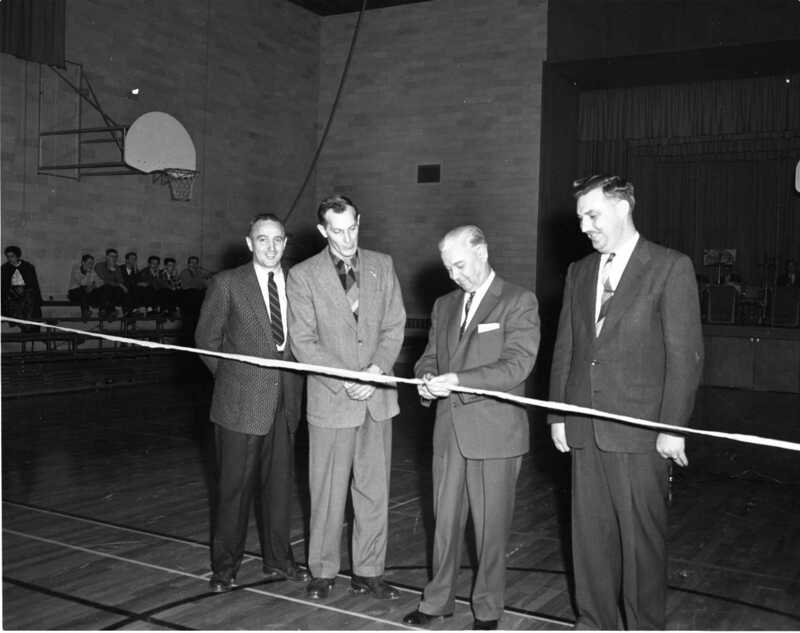 Bing Caswell, former Midlander who now directs boys athletics at Bloor Collegiate, Toronto, Bill Setterington, his counterpart at MPDHS, and principal Lorne M. Johnston look on. 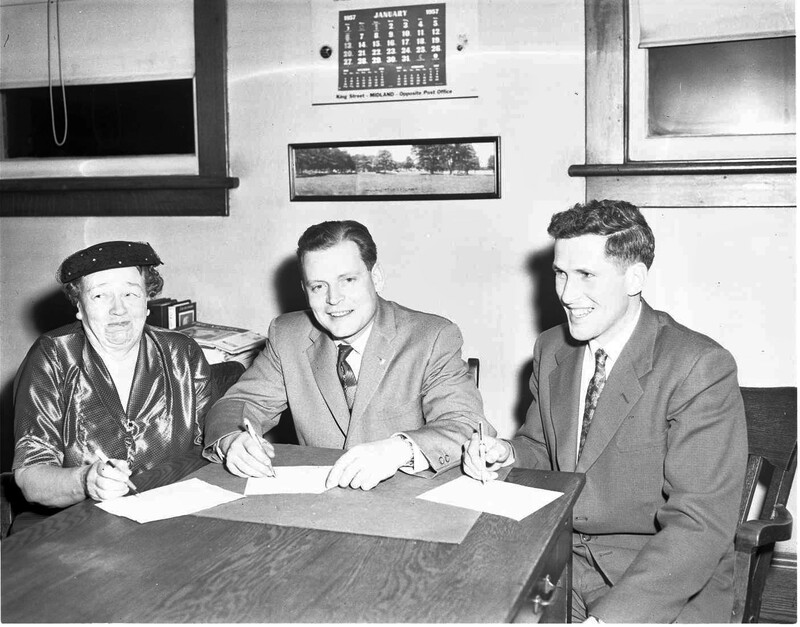 Signing the forms of declaration of office at the inaugural meeting of the Midland Public School Board following their recent election are Mrs. H. McIntyre; chairman Frank Bray and Jack Thompson. 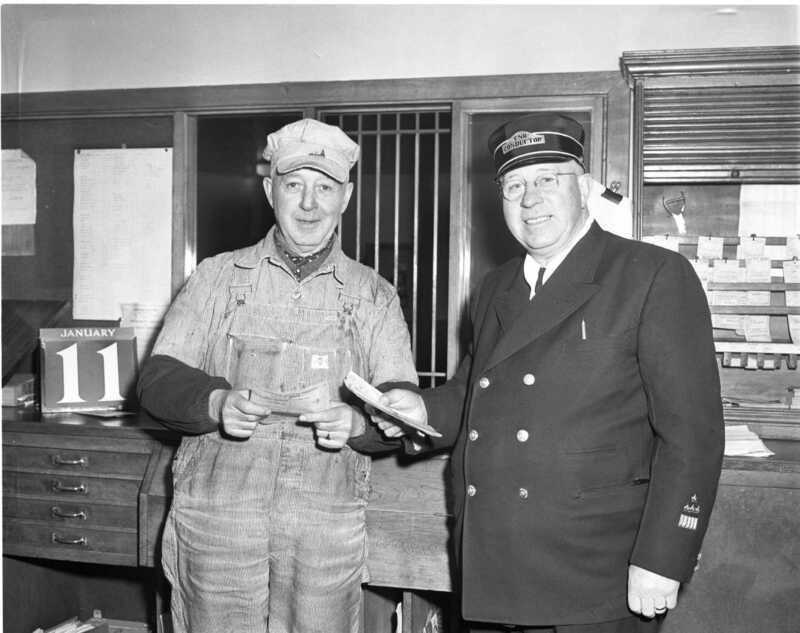 Almost half a century of railroading came to an end Saturday when CNR conductor Jack Milburn, on the right, made his last run from Midland to Lindsay. 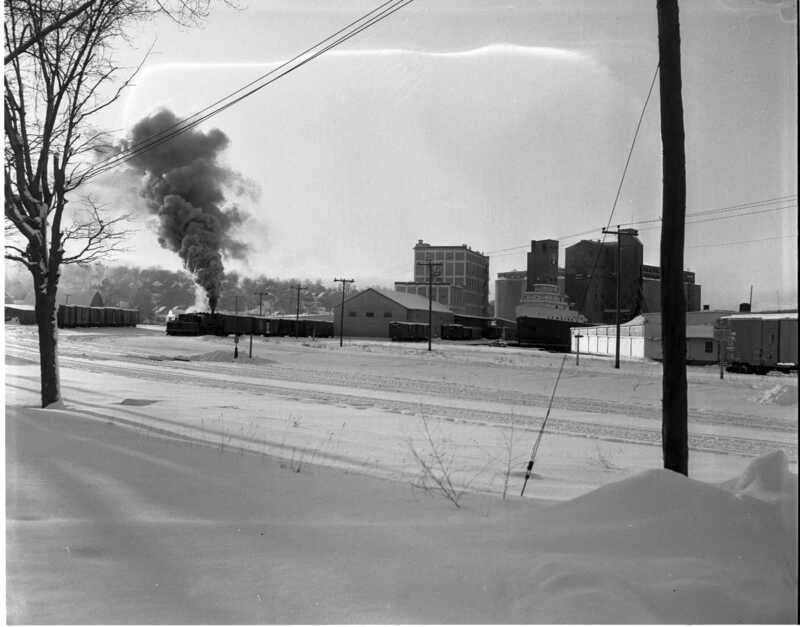 He began his career in Lindsay as a brakeman in March of 1910 and still makes his home there. 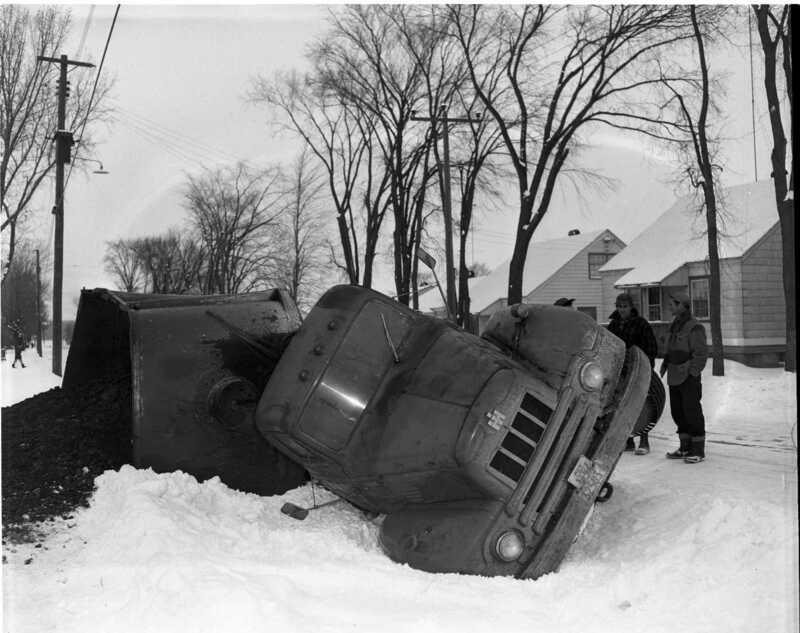 He is seen handing his orders to Engineer Jack Graham, a long time neighbour in Lindsay. Billows of smoke and steam from the CNR switcher attest to the below zero temperatures which held Midland in its grip recently. The cold weather returned again last Wednesday after two days of rain washed most of the snow visible in this picture into the bay. 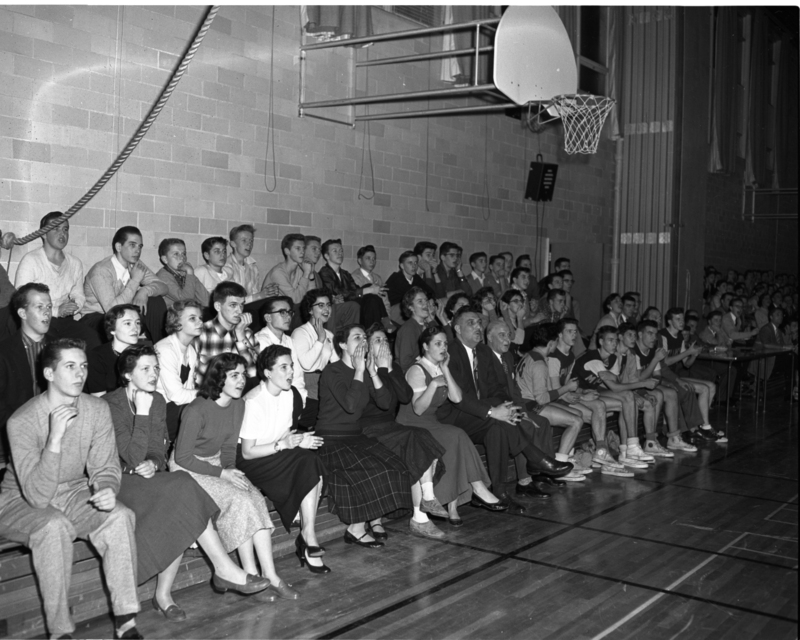 Students of MPDHS watch as their senior boys basketball team play against Bloor Collegiate, losing both games to their city rivals. The girls won both of their games. 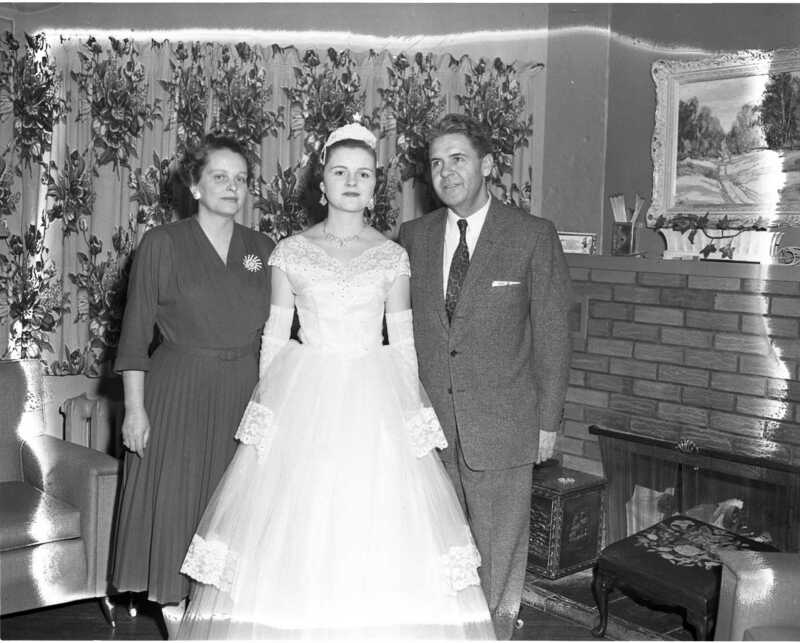 Betty Binkley of Penetang is seen with her parents Dr. & Mrs. W. E. Binkley, she will be representing Penetang for a week at the big winter carnival in St. Paul, Minnesota. 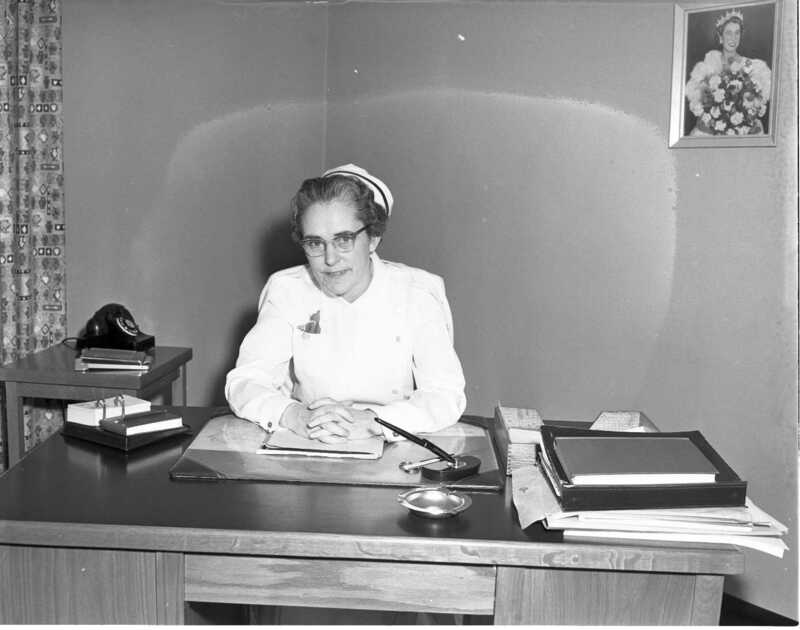 New director of nursing at St. Andrew’s Hospital is Miss Helen Hughes, a native of Cornwall and graduate of Kingston General. Penetang has contracted to replace its eleven year old snowplow with a new FWD truck, the plow and other auxiliaries will be refurbished and used on the new truck at a cost of $10,450.00. Streets chairman Ray MacDonald told council that records show that the old truck had cost an average of $200.00 per year in maintenance, a very low figure for the work it does. Thousands are expected to attend the Penetang Winter Carnival on the first weekend of March, many will be drawn by the “scoot” races, an event unique to our area. The fishing derby is also a big draw, organizers are planning 1,000 holes and are hoping for a bigger winning entry than the six inch smelt that took the prize last winter. Midland has published its annual graduated rate of discounts and penalties for the payment of municipal taxes. Three percent can be saved in January, payment is at par by July and a three percent penalty will be imposed in December. “Wise & Otherwise” editorial feature; North Simcoe, indeed Simcoe County generally has been getting excellent publicity on the metropolitan sports pages for its skiing attractions. Twenty years ago who would have believed, for example, that the Midland-Penetang area would have been recommended by skiers as one of the best winter recreation spots in Ontario. Take a bow again, Pete Pettersen. At the Roxy, Alfred Hitchcock’s “The Man Who Knew Too Much” with James Stewart and Doris Day. Also “Rock, Pretty Baby” with Sal Mineo. W. S. Belfry a resident of the Vasey area all his life, William Stewart Belfry died Jan. 6 at his home following a stroke. He was 81. Funeral service was held Jan 9 at his home with interment in Vasey Cemetery. Rev. Ross Gumming and Rev. J . Dingwall officiated. Pallbearers were Fred Edwards, Orval Edwards, Frank Smitham, Roy Edwards, Morley Edwards, H. Vasey. Mr. Belfry was born in Vasey, Nov. 2. 1875, and received his education there. In 1903 he married Marion Ellen Cummings in Elmvale. A farmer for 45 years, Mr. Belfry was a member of the United Church and the Orange Lodge. He was a Liberal in politics. Besides his wife he is survived by two brothers, Peter and Albert in Midland; and two sisters, Mrs. May Brown, Toronto, and Mrs. J. Bowles of Barrie. Mary Catherine Garrett, a resident of Port McNicoll for 41 years died Dec. 31 in Toronto of a coronary thrombosis. She was 76. Rev. Charles Carter conducted the funeral service held Jan. 3 from Nicholl’s Funeral Parlor. Temporary interment was in Lakeview Cemetery vault Midland. Pallbearers were Mel and George Marchant, Dalton Garbutt, Gordon Young and grandsons T. Lewis and A. Mateff. Garrett was born and educated in London, England, where she and Richard Garrett were married in 1901. Twelve years later the couple moved to Canada. After a years stay in Victoria Harbour, they moved to Port McNicoll. She was a member of the Presbyterian Church. Surviving relatives include Mr. and Mrs. Charles Marchant of Oakville, Mr. and Mrs. F. D. Garbutt of Toronto, Mr. and Mrs. Richard Garrett of Long Branch, Mr. and Mrs. J. Fryer of Toronto, Mr. and Mrs. Arthur Garrett, of Port McNicoll, Mr. and Mrs. A. Young of Belleville, Mr. and Mrs. Percy Garrett of Port McNicoll, Mr. and Mrs. Jack Garrett of Toronto, Mr. and Mrs. Stan Armstrong of Belleville and six great-grandchildren. Joseph Mayer, Thunder Bay, Tiny Twp, died Dec. 31 following a heart seizure. Born in Lafontaine 74 years ago. Mr. Mayer had lived there and in Thunder Bay throughout his entire life. He married the former Armina Marcille at Lafontaine in 1918. Besides his wife, he is survived by four daughters. Mrs. Ludger Vallee (Florida), Thunder Bay, Mrs. Moise Beausoleil (Nalda), Lafontaine, Mrs. Philbert Marion (Jeannette), Penetang, and Mrs. Cleopha Marion (Alpha), Perkinsfield. He also leaves five sisters, Mrs. Alfred Forget, Penetang, Mrs. Sullivan, and Mrs. Kelly, Barrie; Mrs. Fred Deni, Midland, and Mrs. Paul Bressette, Victoria Harbour. There are 17 grandchildren. Mr. Mayer had been a farmer and laborer during his working years. 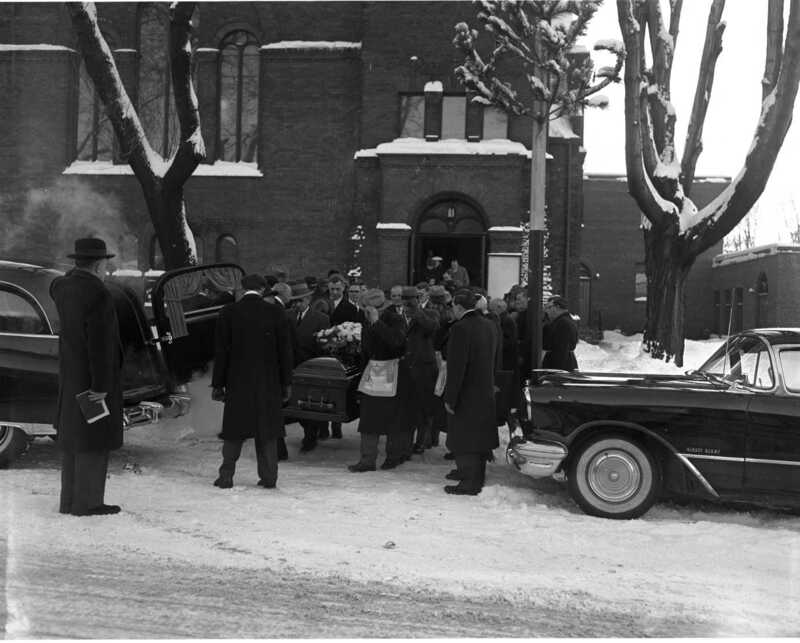 Funeral service was held Thursday, Jan. 3, from his home at Thunder Bay to St. Croix Church, Lafontaine. Father T. Marchildon officiated. Burial was in St. Croix Cemetery, Lafontaine. Pallbearers were Thomas Vallee, Telesphore and Phillipe Forget, Martin Brunelle, Joseph Mayer and Ronald Beausoleil. Stricken with a heart attack as he was on his way to work shortly after 8 a.m. Monday, Thomas Roberts, Midland, died instantly. He was in his 71st year. Mr. Roberts had been an employee of the late D. S. Pratt for 48 years, the last 14 of which he had served as gardener at the Pratt home on Fifth Street. Carrying his lunch pail, Mr. Roberts collapsed in the yard near the corner of a workshop he had intended to enter. Called to the scene Dr. I. T. Weldon, Midland coroner, said no inquest would be necessary. Funeral services will be held this afternoon at 2 p.m. from the A. Barrie and Sons funeral home. Surviving are his wife and one son, Charles, also of Midland. Twenty Five Years Ago – The Women’s Relief Association appealed to the citizens of Midland to assist with monetary contributions for those affected most by the depression. The objective was $5,000. A benefit picture show was to be held for three days at the Model Theatre with all proceeds for the fund. — An explosion in a grain bin in the Collingwood elevator caused burns to one man and slightly injured eight others. Although some of the grain smoldered, a serious fire did not break out. — A new mode in transportation of railway passengers was inaugurated in Midland when a train arrived in town hauled by a “motor driven diesel engine”. —- A seventh death was recorded in St. Thomas following an outbreak of septic sore throat. —- Although the winter of 1931 was the mildest in more than 40 years, 1932 was not far behind for record mildness. In mid-January, 1932, reports were received at the Free Press of budding lilacs, green grass, and dandelions blooming, and several reports of robins. —- Two men from the Moose Point Indian reserve, Billie and Mose Williams, rowed their 17 foot rowboat 35 miles into Midland without seeing any ice during the trip. The first snow they saw was in Midland harbor. Mr. Williams, who had lived in the Harbour area for 30 years, said it was the first time there was no snow on the reserve at that time of the year. Bit of Fun — Said the beautiful Hollywood star: “I love the simple things of life.” And to prove it she married three or four of them. For the fourth consecutive year, Canada outranks all other countries in the number of telephone conversations per person, averaging 446 per capita. This is considerably above the United States, the second-ranking country, with 409 conversations per person. Mr. and Mrs. Jack Gerow are happy to announce the birth of a daughter. Margaret Jane, a sister for Eleanor, on Dec. 17 at St. Andrews Hospital.